Note: This article was first posted some time ago, but in honor of Nikola Tesla's birthday, we thought it would be valuable to repost for new readers. Please feel free to add your own information, article links, or video links about Tesla and his work in the comment section below. I would also point you to Rand Clifford's 3-part series: Nikola Tesla: Calling All Freethinkers! which has a wealth of different information than what you will read below. Also, Dave Hodges' new article: Harnessing Quantum Entanglement Is Humanity’s Secret Weapon highlights the importance of the cover-up that has kept Tesla's true genius from the world for far too long. Nikola Tesla is finally beginning to attract real attention and encourage serious debate nearly 70 years after his death. Was he for real? A crackpot? Part of an early experiment in corporate-government control? We know that he was undoubtedly persecuted by the energy power brokers of his day -- namely Thomas Edison, whom we are taught in school to revere as a genius. He was also attacked by J.P. Morgan and other "captains of industry." Upon Tesla's death on January 7th, 1943, the U.S. government moved into his lab and apartment confiscating all of his scientific research, some of which has been released by the FBI through the Freedom of Information Act. (I've embedded the first 250 pages below and have added a link to the .pdf of the final pages, 290 in total). Besides his persecution by corporate-government interests (which is practically a certification of authenticity), there is at least one solid indication of Nikola Tesla's integrity -- he tore up a contract with Westinghouse that was worth billions in order to save the company from paying him his huge royalty payments. But, let's take a look at what Nikola Tesla -- a man who died broke and alone -- has actually given to the world. For better or worse, with credit or without, he changed the face of the planet in ways that perhaps no man ever has. 1. Alternating Current -- This is where it all began, and what ultimately caused such a stir at the 1893 World's Expo in Chicago. A war was leveled ever-after between the vision of Edison and the vision of Tesla for how electricity would be produced and distributed. The division can be summarized as one of cost and safety: The DC current that Edison (backed by General Electric) had been working on was costly over long distances, and produced dangerous sparking from the required converter (called a commutator). Regardless, Edison and his backers utilized the general "dangers" of electric current to instill fear in Tesla's alternative: Alternating Current. As proof, Edison sometimes electrocuted animals at demonstrations. Consequently, Edison gave the world the electric chair, while simultaneously maligning Tesla's attempt to offer safety at a lower cost. Tesla responded by demonstrating that AC was perfectly safe by famously shooting current through his own body to produce light. This Edison-Tesla (GE-Westinghouse) feud in 1893 was the culmination of over a decade of shady business deals, stolen ideas, and patent suppression that Edison and his moneyed interests wielded over Tesla's inventions. Yet, despite it all, it is Tesla's system that provides power generation and distribution to North America in our modern era. 2. Light -- Of course he didn't invent light itself, but he did invent how light can be harnessed and distributed. Tesla developed and used florescent bulbs in his lab some 40 years before industry "invented" them. At the World's Fair, Tesla took glass tubes and bent them into famous scientists' names, in effect creating the first neon signs. However, it is his Tesla Coil that might be the most impressive, and controversial. The Tesla Coil is certainly something that big industry would have liked to suppress: the concept that the Earth itself is a magnet that can generate electricity (electromagnetism) utilizing frequencies as a transmitter. All that is needed on the other end is the receiver -- much like a radio. 3. X-rays -- Electromagnetic and ionizing radiation was heavily researched in the late 1800s, but Tesla researched the entire gamut. Everything from a precursor to Kirlian photography, which has the ability to document life force, to what we now use in medical diagnostics, this was a transformative invention of which Tesla played a central role. X-rays, like so many of Tesla's contributions, stemmed from his belief that everything we need to understand the universe is virtually around us at all times, but we need to use our minds to develop real-world devices to augment our innate perception of existence. 4. Radio -- Guglielmo Marconi was initially credited, and most believe him to be the inventor of radio to this day. However, the Supreme Court overturned Marconi's patent in 1943, when it was proven that Tesla invented the radio years previous to Marconi. Radio signals are just another frequency that needs a transmitter and receiver, which Tesla also demonstrated in 1893 during a presentation before The National Electric Light Association. In 1897 Tesla applied for two patents US 645576, and US 649621. In 1904, however, The U.S. Patent Office reversed its decision, awarding Marconi a patent for the invention of radio, possibly influenced by Marconi's financial backers in the States, who included Thomas Edison and Andrew Carnegie. This also allowed the U.S. government (among others) to avoid having to pay the royalties that were being claimed by Tesla. 5. Remote Control -- This invention was a natural outcropping of radio. Patent No. 613809 was the first remote controlled model boat, demonstrated in 1898. Utilizing several large batteries; radio signals controlled switches, which then energized the boat's propeller, rudder, and scaled-down running lights. While this exact technology was not widely used for some time, we now can see the power that was appropriated by the military in its pursuit of remote controlled war. Radio controlled tanks were introduced by the Germans in WWII, and developments in this realm have since slid quickly away from the direction of human freedom. 6. Electric Motor -- Tesla's invention of the electric motor has finally been popularized by a car brandishing his name. While the technical specifications are beyond the scope of this summary, suffice to say that Tesla's invention of a motor with rotating magnetic fields could have freed mankind much sooner from the stranglehold of Big Oil. However, his invention in 1930 succumbed to the economic crisis and the world war that followed. Nevertheless, this invention has fundamentally changed the landscape of what we now take for granted: industrial fans, household applicances, water pumps, machine tools, power tools, disk drives, electric wristwatches and compressors. 7. Robotics -- Tesla's overly enhanced scientific mind led him to the idea that all living beings are merely driven by external impulses. He stated: "I have by every thought and act of mine, demonstrated, and does so daily, to my absolute satisfaction that I am an automaton endowed with power of movement, which merely responds to external stimuli." Thus, the concept of the robot was born. However, an element of the human remained present, as Tesla asserted that these human replicas should have limitations -- namely growth and propagation. Nevertheless, Tesla unabashedly embraced all of what intelligence could produce. His visions for a future filled with intelligent cars, robotic human companions, and the use of sensors, and autonomous systems are detailed in a must-read entry in the Serbian Journal of Electrical Engineering, 2006 (PDF). 8. Laser -- Tesla's invention of the laser may be one of the best examples of the good and evil bound up together within the mind of man. Lasers have transformed surgical applications in an undeniably beneficial way, and they have given rise to much of our current digital media. However, with this leap in innovation we have also crossed into the land of science fiction. From Reagan's "Star Wars" laser defense system to today's Orwellian "non-lethal" weapons' arsenal, which includes laser rifles and directed energy "death rays," there is great potential for development in both directions. 9 and 10. Wireless Communications and Limitless Free Energy -- These two are inextricably linked, as they were the last straw for the power elite -- what good is energy if it can't be metered and controlled? Free? Never. J.P. Morgan backed Tesla with $150,000 to build a tower that would use the natural frequencies of our universe to transmit data, including a wide range of information communicated through images, voice messages, and text. This represented the world's first wireless communications, but it also meant that aside from the cost of the tower itself, the universe was filled with free energy that could be utilized to form a world wide web connecting all people in all places, as well as allow people to harness the free energy around them. Essentially, the 0's and 1's of the universe are embedded in the fabric of existence for each of us to access as needed. Nikola Tesla was dedicated to empowering the individual to receive and transmit this data virtually free of charge. But we know the ending to that story . . . until now? Tesla had perhaps thousands of other ideas and inventions that remain unreleased. A look at his hundreds of patents shows a glimpse of the scope he intended to offer. 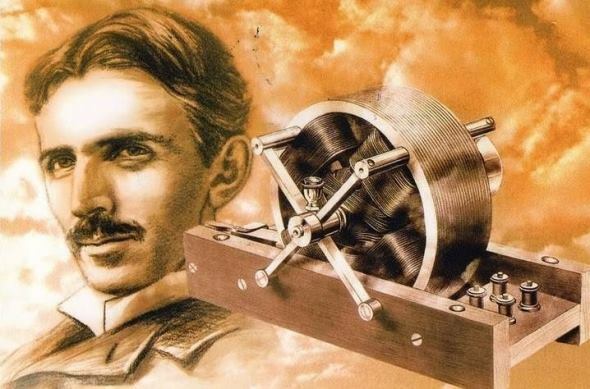 If you feel that the additional technical and scientific research of Nikola Tesla should be revealed for public scrutiny and discussion, instead of suppressed by big industry and even our supposed institutions of higher education, join the world's call to tell power brokers everywhere that we are ready to Occupy Energy and learn about what our universe really has to offer. The release of Nikola Tesla's technical and scientific research -- specifically his research into harnessing electricity from the ionosphere at a facility called Wardenclyffe -- is a necessary step toward true freedom of information. Please add your voice by sharing this information with as many people as possible. Tell your friends, bring it up and discuss it at your next general assembly, do whatever you can to get the word out, organize locally to make a stand for the release of Nikola Tesla's research.... America is tired of corrupt corporate greed, supported by The American government, holding us back in a stagnant society in the name of profit . . . The Energy Crisis is a lie. As an aside: there are some who have pointed out that Tesla's experimentation with the ionosphere very well could have caused the massive explosion over Tunguska, Siberia in 1908, which leveled an estimated 60 million trees over 2,150 square kilometers, and may even have led to the much maligned HAARP technology. I submit that we would do well to remember that technology is never the true enemy; it is the misuse of technology that can enslave rather than free mankind from its animal-level survivalism. Please view the video below, which does an excellent job at personalizing this largely forgotten human being, as well as show the reasons why to this day he is not a household name. German Village Produces 321% More Energy Than It Needs! Stick This Portable Outlet To Your Window To Start Using Solar Power!